Remnants Of Lives Litter Highway To Galveston The strongest evidence of the huge storm was visible just outside the island city of Galveston: The highway was partially blocked by everything from boats, suitcases, a carved pumpkin and other home decorations to chairs, kayaks, toys, wood and other building materials was piled up all over the southbound lane. A boat overturned on I-45, a few miles outside Galveston. Debris is piled up on the southbound lane of the Gulf Freeway. 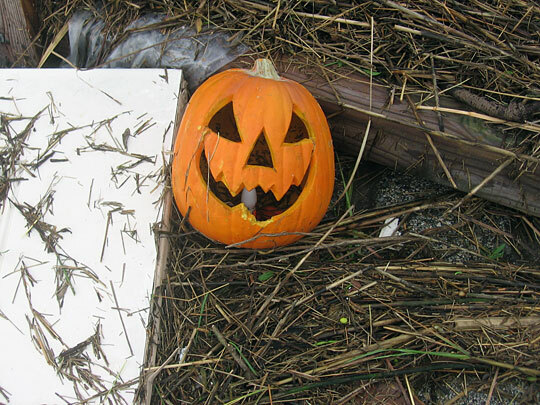 Everything from boats and suitcases to a carved pumpkin and toys litters the highway. 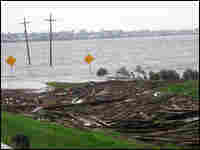 The storm surge reached 11 feet in Galveston. 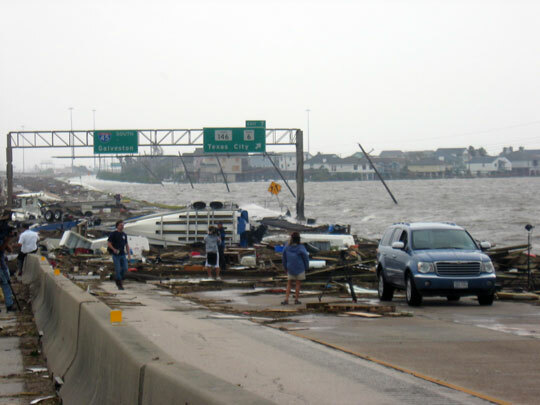 Highway I-45 from Houston to Galveston, or the Gulf Freeway, was surprisingly clear a few hours after Hurricane Ike came ashore. Along the way, Ike marked its path: torn-down billboards, flooded side roads and patches of debris on the road. 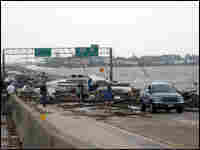 The strongest evidence of the huge storm was visible just outside the island city of Galveston: The highway was partially blocked by people's lives — everything from boats, suitcases, a carved pumpkin and other home decorations to chairs, kayaks, toys, wood and other building materials was piled up all over the southbound lane. The northbound lane was clear, but opened strictly to rescue operation vehicles. 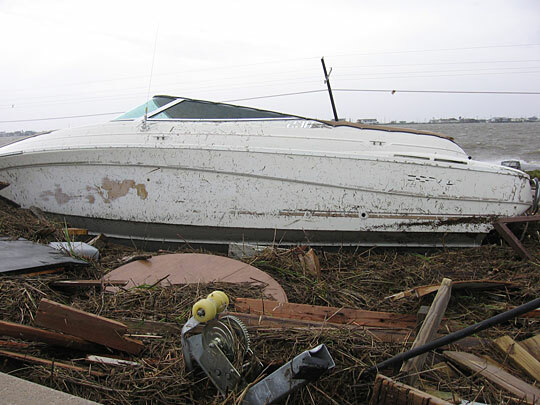 Ike is the largest hurricane to hit the Gulf Coast in nearly 50 years. The enormous storm covered nearly 600 miles across, almost as large as the entire state of Texas. The hurricane's center bore down on Galveston, making landfall early Saturday as a Category 2 storm and bringing in winds of 110 mph. 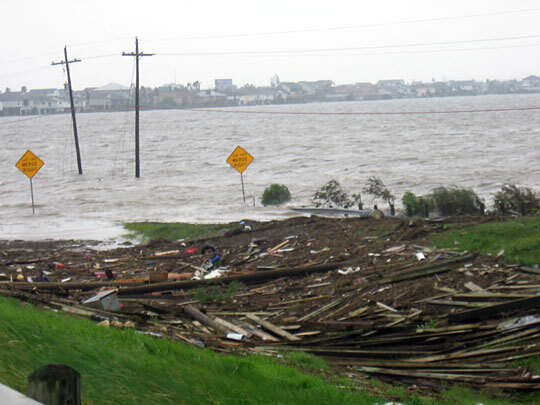 The storm surge reached 11 feet in Galveston and 13.5 feet near Sabine Pass. Dustin Rhoades, 19, a hand on a shrimp boat, is walking on I-45 with friends. Ike left him without a home and without a job, at least for now. 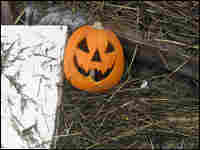 He and his family live in Bayou Vista. The family evacuated to Houston, but Rhoades and his friends came here to see if they could check on their homes, even if from afar. He's not too optimistic given what he sees on the highway. "Oh man, it's crazy," he says. "There's boats all on the freeway here. It's crazy." Rhoades hopes water didn't reach the second floor of his house, although he's sure his house is flooded. "Oh, downstairs is gone. Completely under water." Even though the island was under mandatory evacuation, many residents decided to ride out the storm. 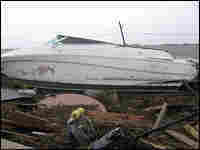 Authorities estimate there are about 140,000 or more residents who stayed behind despite warnings they could die. Earlier Saturday, Texas Gov. Rick Perry warned that no one would be allowed back on Galveston except emergency personnel. He said people already on the island could stay, but anyone who leaves won't be allowed back in until the island is deemed safe.